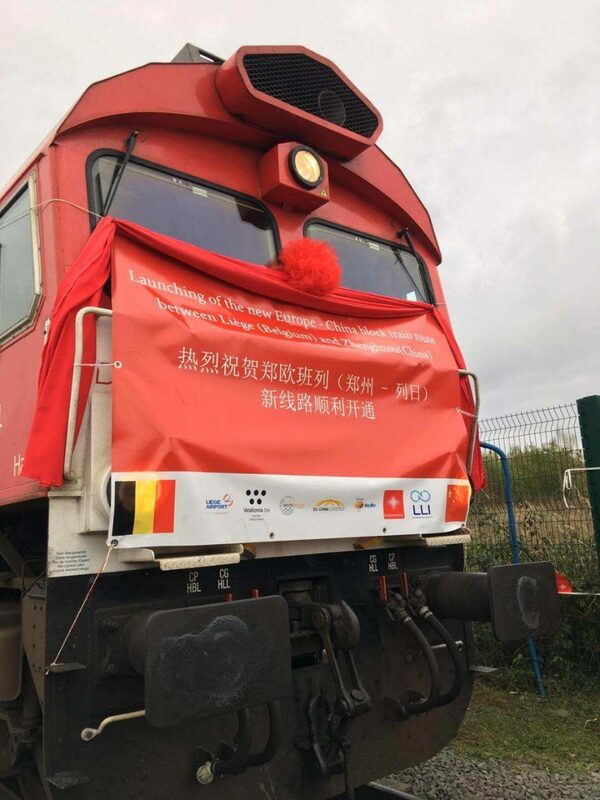 This week, Belgium and China finalized a “One Belt, One Road” network by jointly launching a new direct freight train between Liège and central China. The first train of 29 wagons and 37 containers set off yesterday from the Bierset multimodal rail-road platform, operated by Liège Logistics Intermodal, and will travel 12 days across the continent via Russia before arriving in Zhengzhou, the capital of China’s Henan province. In Zhengzhou, operations will be handed over to Chinese logistics hub Zhengzhou International Hub Development and Construction Co, Ltd. (ZIH). The train, fired by a German private locomotive, is loaded with goods including auto parts, baby food, pharmaceuticals and steel products for import stores in Central China. On the border between Poland and Belarus, the containers will be transshipped via wagons adapted for the different gauge of Russian railway tracks. This same procedure will be repeated on the Russian-Chinese border. In total, the freight train departing from Liège will travel 11,000 kilometers before arriving in Zhengzhou. Since the launch of freight trains between China and Europe in 2014, nearly 11,000 trains have moved between European and Chinese cities. ZIH most recently chose Liège as its European base while seeking a stop on the way to German cities Munich and Hamburg. Liège’s strong logistic capabilities and upcoming status as an Alibaba hub played a large part in the decision, according to Michel Kempeneers, COO of overseas investment for Wallonia Export & Investment Agency (AWEX). Although the idea of a rail link from Liège to Zhengzhou was first suggested during a 2013 Wallonia development mission to Henan province, ZIH did not commit to Liège until May 2018, when Alibaba announced Liège Airport (LGG) as its European hub. Not wanting to rely solely on supplying its Liège hub stocks by airfreight through its subsidiary Cainiao, the Chinese giant of e-commerce diversified its strategy to include freight trains to Liège through ZIH, thus compelling ZIH to select Liège as the destination for its localized European hub. Officials now await the results of the strategy, following this first freight train launch.